Anyway, the one in question is 4-9, Travel Warlord. It\'s a mob consisting of Hecate and four elf girls (or something) ALL of which don\'t attack, but cast Demon Chant, every round, thereby healing the whole mob completely. I can\'t hurt them at all. My own Hecate is worthless, as are the maxed-out Dodge gems that everyone tells me I need. If there\'s some trick to getting past this, nobody I know is willing to share it. I\'ve tried several Aegis but they don\'t work well enough. I need some solid advice here. My party at present consists of my main (Berserker), Godless, Divine Angel, Hecate, and Valkyrie, all 86. My deployed Angel now is Mikaela (Ungodly) and I also have Pandora, Seraphim, Polly, Aoede, Styx, Isolde, and all the ones you can unlock for free. any level whether eternal spire, zodiac, dark abyss, or totem that has massive healing by multiple monster is a damage check level. you must build your party to some how in 1 turn has enough concentrated atk power to take down 1 monster, if not then the next turn they heal and all your previous damage is wasted. from the composition of your party there is no way to achieve this, because your main, gw, divine angel will spend most of their atk on auto hitting, and auto hit does absolutely minimal damage. Okay, forget about Hercules. I\'d need months to get him. I\'m not a money player. No healer? Should I just leave Hecate out? Go with a party of 4? Spellbreaker Totem?? I already dumped my red healing totem to work on a Dragon Totem that they say I need and now I need to work on another?? and yes to not using hecate, you wouldn\'t be able to use your backup hero anyway since the totem bosses only heal and won\'t attack you. For Infinite rage, basically trying to get full rage each round for your strongest hitters. you have to play around with party formation a bit to work out what maximizes rage the best for you. How do you suggest I get the money to gain the stuff in HoC to get these heroes? Like I said, I am NOT a money player. It took three HoC events just to get Hecate. Ancient Rage? What the sam-hill is that? 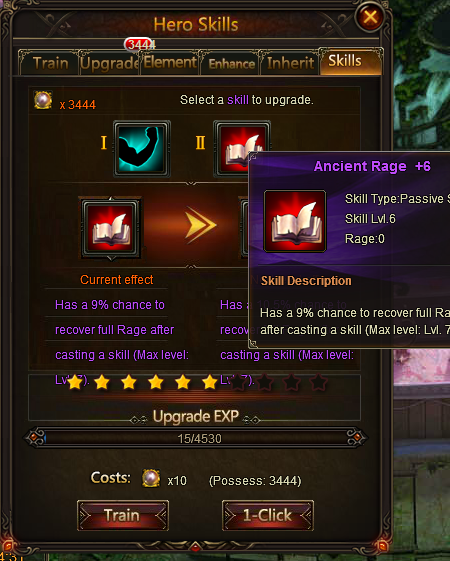 Ancient rage is this thing. You can upgrade skills for each hero. It eats up blessed stones though, and the percentage is pretty low, might not really be worth it. Ah. So now I need a few million Blessed Stones, a 42 more Astral Hunter shards and 400 Topaz Herosouls. I should be able to get past this mob by September with a plan like that. 2019-4-23 08:41 GMT+8 , Processed in 0.056404 second(s), 48 queries .